NEED: Just in case you need a winter jacket or coat this winter, think oversized, slouchy and big as being shown by leading fashion designers. On the left, former model turned editor and now global fashion director for Harper's Bazaar, Carine Roitfeld, is wearing one of Max Mara's 2013 oversized coats. 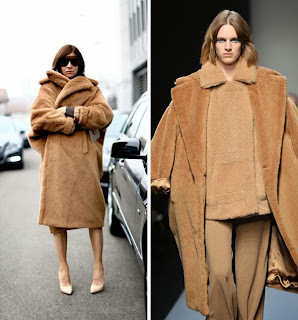 If you decide to go with this oversize look and you are not model tall and thin, it might be best to stick to a 3/4 length jacket instead of a coat. Keep accessories to a minimum - forget the bulky knit scarf or snood when wearing a jacket with that much bulk in the body and shoulders. You can balance the look with skinny pants and sleek knee-high leather boots - wearing chunky heels or grunge lace-ups just won't do it. As far as your bag goes, it too should be slim rather than bulky and forget a shoulder strap. It just won't go over the bulk and sit that well. Either carry a clutch or a stylized slim case with a short handle. NICE: The Celine over-sized pink coat. NOTE-WORTHY: Oversized, slouchy, and big are fine attributes when you have to layer bulky knit sweaters underneath. That's the kind of layering we are most used to; however, this year layering shorter jackets over coats is also being shown. It was Joseph Altuzarra who featured a waist-length leather jacket over a slim fitting winter wool coat. 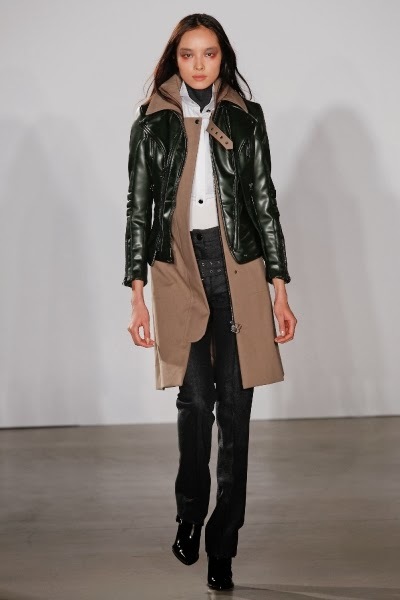 Altuzarra is a Parisian born designer who launched his first independent collection in New York in 2008. His "top" coat layering was an interesting twist shown against the oversize jackets and coats shown by other designers. Perhaps . . . if I was 20 years younger.